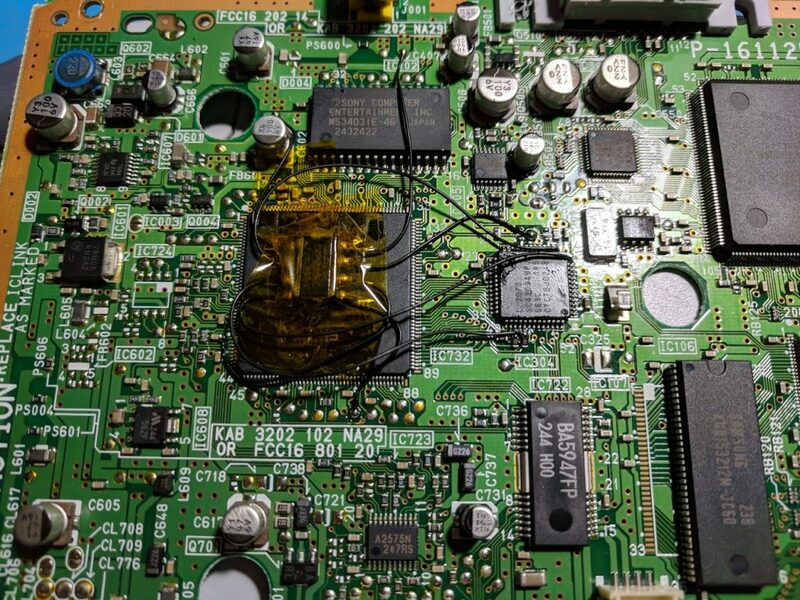 Towards the end of the SCPH-10x PSone production Sony revised the board slightly and released the PM-41 (2) board. 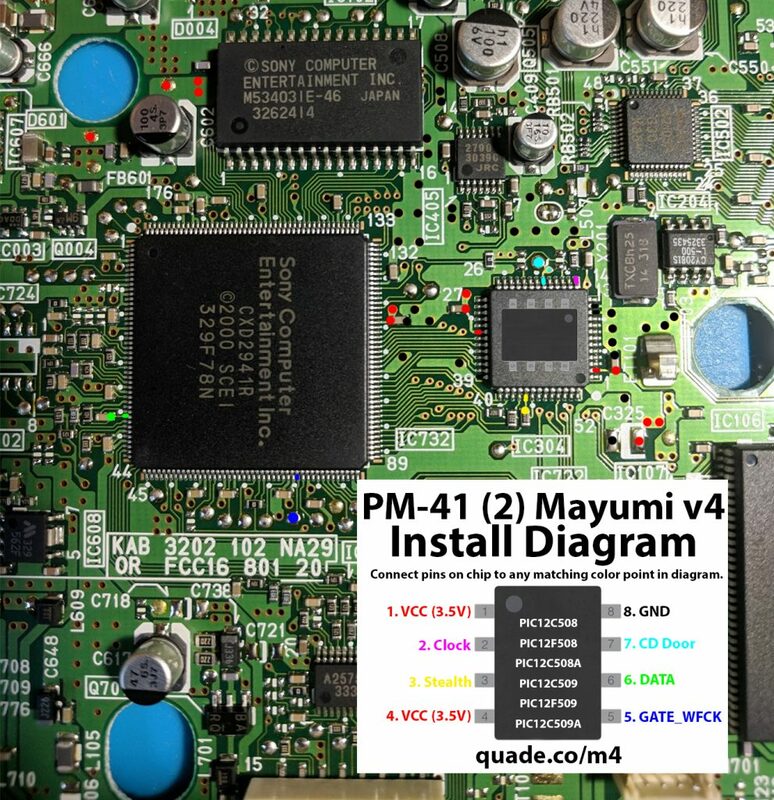 This page covers the installation diagram for installing a Mayumi v4 chip into the PM-41 (2). If your board has PM-41 printed on it then you should follow the PM-41 guide instead. Here are some tips I have for you when you are soldering your chip into the PM-41 (2). Don’t apply too much solder to pin 2 and pin 4 or you’ll bridge the pins on the chip. 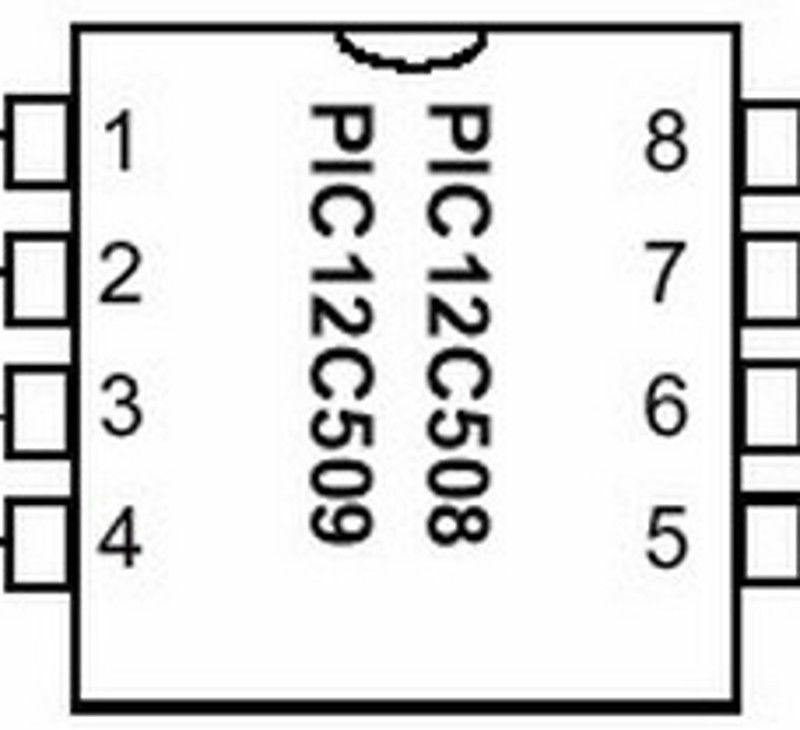 Placing the chip directly on top of the shorter large chip (where it is in the diagram) seems to be the ideal location. Did You notice “chirping” noise? Like this? It shouldn’t be making any new noises with the modchip installed. It shouldn’t, but this motherboard (PAL) with ONEchip installed actually chirps, so I’ll try to figure out if other modchips works different/better. I thought about using two modchips at once. I haven’t tested running multiple chips in a single system at the same time before, but it really isn’t something you need to do. On its own the Mayumi v4 will not work well with PAL PSones. Non-PAL games won’t run because of the region locking in the BIOS. The ONEchip on its own should work perfectly. It patches the BIOS to allow playing non-PAL games, and acts as a modchip to allow playing backups. For PAL PSones your only two real options are the ONEchip, or a PsNee chip on an ATmega board. More or less that’s why I am asking about Mayumi.